October is the month of fear, fun, fantastic costumes and junk food, and with Halloween on 31 October looming, one of the biggest challenges can be to find the perfect outfit for your Halloween party, and indeed for the whole family. Choosing an outfit doesn’t have to be a nightmare, and you can find a good selection of costume ideas at a number of major fashion retailers, supermarkets, department stores and budget shops with prices to suit every pocket. Whilst having an idea about what you want to dress up in is a helpful starting point, don’t let this limit you from trying other costumes or characters. And it’s not just the kids who can dress up; there are numerous costume options available for the adults too. Are you going in a group? If the answer is yes, pick a theme that everyone can stick to when choosing their costume. Some theme ideas may not be around Fright Night, you may ant to opt for superheroes or comic book characters, your favourite movie character, or anything else that tickles your fancy. How far are you planning to go? When it comes to dressing up, you get those who will put on a hat and glasses and call it quits, and those who go the extra mile and rent costumes with added props for authenticity. Before taking the plunge and buying or renting a costume, decide how involved you want your costume to be. Sometimes the simpler the costume, the better. Do your research. By researching your costume idea, you may find that you already have some accessories at home that could work well with your costume, allowing you to spend more on the props and items you still need to purchase. With so many costumes on offer, there really is no limit as to what your kids can dress up as this Halloween. Whether your little one is a baby, a toddler a tween or a teen, the shops are full of fun and frightening gear that will make this Halloween one to remember. From witches and wizards to ghosts and ghouls that will bring the fear factor, and princesses and pirates for something a little less scary, kit them out from head to toe, invest in some face paint and don’t forget to arm them with a festive bucket for all their treats. Halloween Frankenstein Suit, Silver Witch Costume and Mummy Costume from £6.99 at Home Bargains. The right accessories can make or break any Halloween outfit. Claire’s has a range of Halloween accessories in stock that can take any outfit from drab to fab. Whether it’s a wig to finish off a look, or you’re looking for masks, make up and jewellery, the perfect accents to your outfit will make people notice you this Halloween. Why not make this Halloween a family affair? With costumes and accessories for the adults too, there is no excuse for the dressing up to be left to the children. When it comes to Halloween make-up, there’s no need to go out of your way to purchase a bundle of products you won’t use again. Use your basics, and only buy the few special products you will need, like coloured eye shadows and flash lashes that you may not ordinarily wear. Halloween isn’t just about the costumes. There’s décor and snacks and treats to consider too. From pumpkin lanterns to plastic spiders and cobwebs, creating the right atmosphere is everything. And don’t forget the treats, after all, that is what most of the kids will be after (and a few adults too). 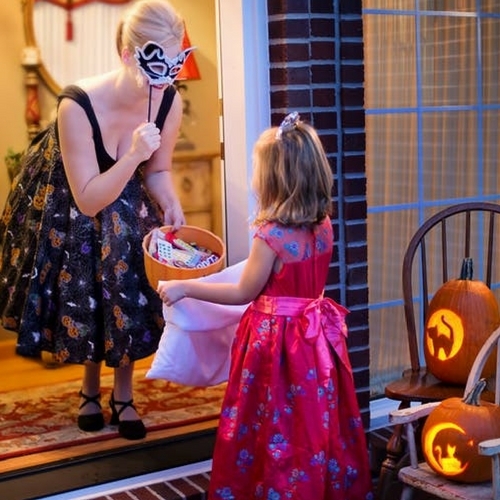 At the end of the day, a little bit of planning, and knowing where to shop for bargains on décor and sweet treats can save you time and remove the stress when it comes to getting ready for Halloween.